If the goods received are slightly wrinkled, don't worry, it is the fold on the back. When you tear the film on the back and stick the wallpaper, the wrinkled will disappear. It can only stick once if on a surface that is not clear and not smooth. It can be repeatly sticked within the first 24 hours. The stickiness will be better and better after sticking 24 hours. We use the highest quality materials to ensure your product will last. Self-adhesive canvas, can be repeatedly pasted on smooth materials without leaving glue marks, like marble, glass, acrylic, etc. Premium canvas prints, waterproof, UV resistant pigment inks with vivid colours, will last forever and never faded. 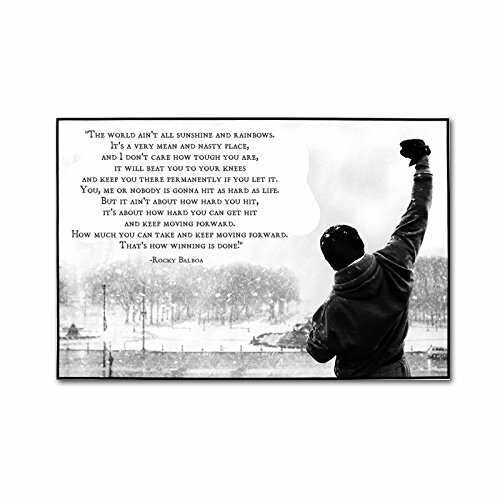 The perfect wall poster gift for decorating home, bedroom, playroom, classroom, dorm room or office workspace. No frame, can be framed to hang on wall. Please make sure the wall is smooth if directly stick. Measure 16 in x 24 in(40cm x 60cm) - Ships quickly and safely in a sturdy protective tube. If you have any questions about this product by AKI, contact us by completing and submitting the form below. If you are looking for a specif part number, please include it with your message.